The Maori Party is ready to put aside the old guard’s animosity towards Labour and help Andrew Little form a government if a “coalition of the willing” is possible after 23 September, co-leader Marama Fox says. Don’t take that as indicating a preference, though. A continuation of the current National-led coalition remains a central scenario. Key message: The Maori Party is positioning itself as an alternative Kingmaker to the Winston Peters-led New Zealand First. A candidate drive in six of the seven Maori seats, and a party vote campaign aimed also at Pasifika and Pakeha on the general role, has Fox chasing a pipe dream of 10 or 11 candidates entering Parliament - eventually. She is grounded for now, saying four or five seats this time around would be a solid building block for future elections. Four or five seats might just be enough to make the difference in 2017. They could cover a drop in National’s vote of a couple of percentage points, meaning Bill English would be in position to form a government without Winston Peters. The PM might have to agree to a few policies. Water, Whenua, housing, povery and Te Reo are likely to be the Maori party's key "negotiating lines." Compulsory Te Reo in classrooms might even end up as a bottom line - it's not certain yet. On the other side of the ledger, Fox believes her party is ready to support a Labour-led government, as they turn away from the “old-school” animosity created by the 2004 foreshore and seabed saga which saw Tariana Turia break away from Labour. Indeed, the party with the closest policy platform to the Maori Party is Labour’s partner, the Greens, Fox says. The big question in the scenario of the Left is whether such a coalition could govern without New Zealand First. Peters’ own animosity towards the Maori party and ‘race-based law’ has been well documented. That’s his problem, not the Maori Party’s, Fox says. But, then again, it might just work. Who would have thought the Maori Party could spend nine years supporting a bunch of Tories? It shows they can work with anyone, and Fox says she personally gets along with Peters. It all depends on what mandate the party’s leaders are given by their members after the election. That last part is in fact why I headed over to interview Fox in the first place. Just how does the Maori Party decide who it might go into coalition with after an election? Do the co-leaders decide? a Party council? An Iwi council? I realised I didn’t know. I was one of those students for whom the foreshore and seabed hikoi was the largest protest we had ever seen. It was one of the two moments that made us realise we should at least show an interest in politics (the other was interest-free student loans). A key point that stuck in the mind was how the relationship between Maori and Labour hit the rocks so fast. Has it recovered? There was some very firm animosity between the new Maori Party and Labour, Fox says. While she talks about how that was the old-school way of treating the situation, she still doesn’t pull her punches. “They took foreshore and seabed off us, lied to the nation – they said, ‘don’t give those Maoris the blinking foreshore, you’ll never be able to go to the beach again.’ And then one month after they closed the foreshore and seabed legislation, they signed out oil exploration contracts with people to come and have a look for oil in our waters,” she says. A Coalition of the Willing involving Winston Peters. He’s not the biggest fan of the Maori Party. Just how is that relationship, then? “Well Koro (grandad) Winston is an enigma, isn’t he? He’s so charismatic and he’s so dynamic. But we don’t agree with his politics, and he doesn’t agree on ours,” Fox points out. It sounds like the Maori Party may have learnt its lesson then in terms of being open to a coalition with Labour, without the past playing too major a role. Does Fox think Labour has learnt as well? “Some people want a change. Maori want change, but they’re not sure that Labour are the ones they want to give it to. If you really want a change, vote for us, because we just need to hold the middle. We don’t need 50%. If we hold the middle ground, no one side can make a move without us,” she says. Fox says she was more incensed when Labour opted to keep its current Maori MPs off the party list than they seemed to be. “It was a good tactical move – ‘it’s us or nothing’ – but actually it doesn’t look good for Maori, to take Maori off the list, which means they don’t even appear in the top whatever. And it looks like we’ve been back down the bus, out the gate. They’re not even on the bus,” she says. “If the writing is on the wall, they are a party of the past. New Zealand First are a relic of the past talking about let’s go back to colonisation and stick you in the corner and please don’t talk." Fox mentioned Kelvin Davis, who’ll be up against Hone Harawira in Te Tai Tokerau. Harawira should get a boost from the Maori-Mana alliance. 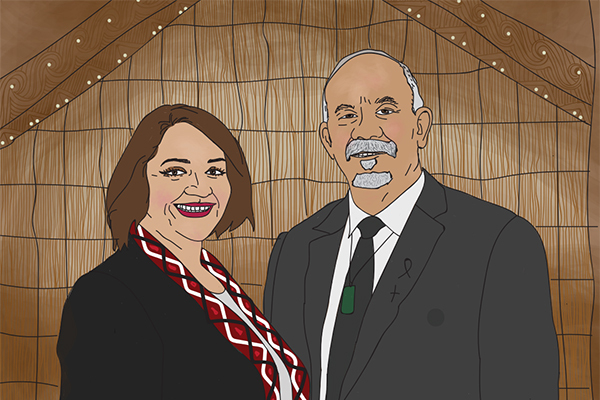 The Maori Party will call on its supporters give Harawira their electorate vote, but party vote to them – along with a two-tick call for the Maori Party in the rest of the county. How does she think Harawira will go? “I hope that Hone does well. I view Hone as whanau. And every now and again whanau toss toys,” she says. Leaving aside Te Tai Tokerau, the Maori Party has designs on the other six Maori seats. It will be a tough ask – they only have one now (Fox is in on the list). But the party this time around is also standing Pasifika and Pakeha candidates in the general roll seats. So, which side would she like the Maori Party’s seats to be backing, if they had a choice to go with either Labour or National? It all depends on the outcome of the vote, though, not someone’s pipedream beforehand. “After the  election, we went around the country…and put the pros and cons up. Everybody got to have their say, some of those meetings were two, three hours long,” Fox said. How about bottom lines? When do we hear what the Maori Party would demand if they were to help either National or Labour form a government? The current agreement with National is a good blueprint – there are five conditions to the relationship: No surprises, Ministerial warrants, the ability to command budget for those warrants, punting up the odd party budget, and confidence and supply. Those are the high-level principles. The party is now going through a process developing policy to take to the electorate. “Water will be a priority, Te Reo Maori will be a priority, Whenua would be a priority, housing would be a priority, and really doing something about poverty,” Fox says. “Kaupapa Maori model’s a practice and not something to be scared of. Who says the investment model’s the only way to do stuff? Or the Victoria model of education’s the only way to do stuff?” Fox says. “Red undies and blue undies have had equal amounts of time in this country to operate over the last 150 years, and it’s the same skid marks left behind. If we really want to change then we’re about the change. We’re about trying new models that work, where we are all valued in this nation. The last language to be made compulsory in classroom in NZ should be Te Reo Maori for obvious reasons. I disagree completely, and actually find your "For obvious reasons" comment to be highly offensive. I grew up in middle white suburbia. I speak English and nothing else, as does everyone I know. I too saw little use in speaking Maori. But then I went to Ireland, where they are teaching Irish Gaelic across all schools. The benefits were staggering. - Brain stimulation resulting in an increase in grades across almost all other school subjects. - Kids felt proud about their culture. Business wise it is becoming a great asset. - In meetings with other parties they can discuss tactics etc without being overheard. - It led to more opportunities and fostered growth in local products and services. Travelling around it would have been great to speak a language that no-one understood, it enables private conversations which can help in negotiating and bargaining, even just talking privately when dining out or sitting in a bar. It would have made me and my friends feel a bit less stupid when ever we spoke to someone and realised they spoke 2-3 other languages. Would you tell the Belgians to drop Flemish? or the Luxembourgers to drop Luxembourgish? The Basque to drop Basque? Iceland to drop Icelandinc? All are minority languages of zero use internationally. Maybe the Chinese should drop Mandarin and Cantonese and focus solely on English, after all "for obvious reasons", both are of little use when dealing with the 6 Billion non-chinese on earth. To say Te Reo shouldn't be taught is idiotic. In a global world we are one of the very few countries with no commonly spoke local language. If anything it should be compulsory to have all citizens fluent in Te Reo and English. I personally believe the only language that should be compulsory in NZ is English, any other language learnt should be a choice. I would prefer that my children were taught Latin over and above Te Reo as even though Latin is a "dead" language it is the basis of the romantic languages, and all manner of professional jargon which is extremely useful. I was taught Latin which enabled me to travel throughout the world with some understanding of what was being spoken even though I did not understand the local language, in fact a group of people made up of many nationalities were able to to converse with a smattering of Latin. I would like my children to benefit from their education and give them the best opportunity to be competitive in an increasingly global situation. I hope this does not offend you, but I think freedom of choice is very important. I am not at all offended by your comment. You have raised some valid points. I would have loved to have a grounding in some other language - I had some basic french which I tried to improve on. But I would put it to you that we already speak a "global" language, English. I am suggesting we a speak a language unique to our country. It has numerable benefits, and the only real negative I have ever really heard raised is "No one else speaks it". Which as per my original post shouldn't be a problem. There are a lot of countries, many even smaller than NZ that have local language(s), and use English as a global Language. Do they make languages compulsory in those countries though? Casual study of a language and compulsory study of a language are two fundamentally different things. In Belgium it is compulsory to learn minimum of French and Flemmish. English is not compulsory, but is recommended. Ireland it is compulsory to learn Gaelic in conjunction with English. In most other countries the native language is taught, with English as an elective. I think being multi-lingual in English and Te Reo is no different to these other countries. Technically in NZ only Te Reo and Sign language are formally recognised as "Official" Languages. With English being "Common use". Belgians learning Flemish and Luxembourgers learning Luxembourgish and Basques learning Basque and Icelanders learning Icelandic is like Maori learning Maori. There is a compelling spiritual reason for doing so. Whilst I understand your need to expound " spiritual" reasons I for one would rather rely on empirical evidence. An exercise in futility, is the Maori Party. Nymad, unrelated but maybe of interest to you given last weeks discussions. "The gross profit margin on fuel at the pump had doubled to about 30 cents a litre"
There are so many structural issues in that analysis, it's not funny. What's that on TR per litre? 15%? How many businesses have you worked for in a pivotal pricing role? Because if you think that gross margins of at most 26% is unfairly high, you're crazy. Sure, if that was net margin, I'd agree that it's excessive and indicative of structural issues in the market. But without knowing overheads, you cannot deduce that this is excessive. Sure 'profits' have increased nominally, but without normalising that, any deduction is more to do with bias than objectivity. I have been a pricing analyst at Microsoft, so I have a fair idea. In essence the report said that pricing did not reflect the reasoning logic. They did not have complete info as it was not a ComCom investigation. They think there is enough evidence to launch a ComCom investigation, which will undoubtedly go deeper and provide a much more detailed view. As I, and many others have said, I don't mind them making a profit, I do mind the reasoning given for increases, that then when reversed do not see decreases. The recent unknown drops reported across a range of media, seem very much in line with the reports release date as a means to hide the profiteering. What was their gross profit margin? Did you report them to the respective regulatory body? What evidence do you have, over and above the exact same evidence for any other industry? Like I have said to you in the past - report them yourself. You'll come to see that the same complaint is a dime a dozen at the CC. Why don't we report any other retailer, on the basis of a gut feeling? "As I, and many others have said, I don't mind them making a profit, I do mind the reasoning given for increases, that then when reversed do not see decreases." That means that you fail to understand the market and have let your biases get in the way. Profiteering is not illegal, and nor should it be. Having worked at Microsoft as a pricing analyst, you should understand this. Also, as a pricing analyst, you should have an excellent understanding of industrial economics and markets which would make it easy to reason away the objections you and Boatman seem to have. "Why don't we report any other retailer, on the basis of a gut feeling?" 1. No other retailer cites a specific reason for an increase, or has such fluid prices. 3. No other product sees exact matching price changes on the same day at the same time. I guarantee if Whittakers and Cadbury matched block sizes and prices at exactly midday tomorrow, there would be some questions being raised. When we altered prices, we never disclosed any precise reason, usually "change in market" or "change in costs". We also had no idea what our competitors prices would be until we saw them (i.e. it was fully reactionary, rather than the pre-emptive pricing we see in fuel) I would also note, that we got hammered by the EU for pricing and Bundling. "I guarantee if Whittakers and Cadbury matched block sizes and prices at exactly midday tomorrow, there would be some questions being raised." That shows that you don't understand the market. You aren't comparing similar things with that analogy. "We also had no idea what our competitors prices would be until we saw them (i.e. it was fully reactionary, rather than the pre-emptive pricing we see in fuel) I would also note, that we got hammered by the EU for pricing and Bundling." You are saying that Microsoft was never a first mover for it's product lines? Are you sure you worked at the same Microsoft that everyone knows? "No other product sees exact matching price changes on the same day at the same time." I challenge you to find any retailer that has precisely exact changes in prices. Sure, they move similarly and at similar times, but it isn't exact. As I said, any basc understanding of IO will outline why this is the case in such a market. Again, it is your bias clouding your judgement here. Do you have many friends nymad ? I can't see how that's relevant..
Agree, play the ball not the man. "I challenge you to find any retailer that has precisely exact changes in prices." I can't, that is why fuel in this country is so suspicious. It is not bias, or gut feeling. It is experience. Pricing never matches up with such regularity with such timing. We are not seeing a retailer set a price Monday morning, and the competitor down the road changing it an hour later. We are seeing both retailers change at the same time on a Tuesday. This is amplified when we see the big two withhold any changes until the third (gull) comes into town. Hence the "Gull effect" - or actual competition as it more commonly called in the rest of the world. Surely you can reason what the 'Gull' effect is if you were a pricing analyst. Just look at the operating model. You severely mistake profit for anti competitive behavior. A good comparison would be Air Travel. Easy Jet came into Europe on a never before seen operating model and competed purely on price. A lot of their "Cheap" prices were loss leaders though, and were clearly unsustainable in the long run. They also struggled to make a profit the first few years. When the Full service airlines price matched, their profits reduced quite noticeably. As expected Easy Jet were unable to maintain such ludicrously cheap prices, and eventually a new equilibrium price was set. The Full service airlines were able to maintain a slight premium for the extra services they offered. Historically even a 1-2cent per litre difference has seen the more expensive forecourts sit empty. Yet unlike easyjet, Gull has come in at significantly lower cost, yet seem to sustain these prices. Also unlike the other full service airlines, BP and Z seem to be able to price match, yet continue to make larger profits. Finally, unlike the full service airlines, the full service Petrol stations do not add a premium to the fuel price. The extras they offer are priced accordingly and are most likely profitable in their own right. Therefore in a "Competitive" market, how is it one retailer can operate it's core business so much more efficiently? The only conclusion you can draw is that the other two were not efficient, which suggests a non-competitive market. Look at the model of Gull. What is their key differentiating point that allows them to price lower? They aren't priced lower though. Where Gull exist the others have dropped too. You are asking the wrong question. How is it the other two could maintain a price until a third came in. It's almost like Australian Supermarkets. Two had it pretty good, then bang in came Aldi. Some have suggested that the first two may have been less than competitive. Add to that the mainstream companies down SH1 which have no signage our about their price, you know there is a problem there. But Nymad can't make it work in theory, so clearly it can''t exist in practice. Tell me - these allied petroleum outlets that you often speak of, what overheads do they have? I seem to never see them advertising. I wonder if that impacts their P&Ls somehow? Do they have comparable brand awareness? What is their model for competition? Is it maybe price? What other services do they offer at their stations? P.S. The only thing I can't make work in theory is your tin foil hat perspective. A different opinion is not a conspiracy theory. Nymad, your entire view is based purely on economic theory. You are ignoring the real world evidence. - price changes are synchronized. - oil goes up $10, prices go up 3c, oil goes down $10, prices remain the same. If it happened with such regularity in any other industry you would be crying foul. "What is their model for competition? Is it maybe price?" As for this, oh man. Just ask any expert, marketing or pricing person in NZ. We are probably the most price sensitive market in the western world. Further to that Fuel is one of the most price sensitive products in our market.They all compete on price, that is again why having such static, similar prices raises concern. When Gull comes into a town, we don't see Z and BP promote their forecourt attendants, cafes, and overpriced groceries. We see them immediately drop the price. An opinion is the problem. We need facts when debating this. My experience is both theoretical and industry. - prices are not syncronised exactly. How you prove this, I have no idea. - your price changes are, again, anecdotal. If you look at the nominal cost of fuel over the last 5 years, it has hardly changed. You argue that fuel doesn't track with world prices, but you have no basis to assume it should - do you know the forwarding positions, etc? "As for this, oh man. Just ask any expert, marketing or pricing person in NZ. We are probably the most price sensitive market in the western world. Further to that Fuel is one of the most price sensitive products in our market." Okay, again, that is on the basis of absolutely nothing. "When Gull comes into a town, we don't see Z and BP promote their forecourt attendants, cafes, and overpriced groceries. We see them immediately drop the price." Again, basic IO with regards to a commodity good. If you are a pricing analyst, this shouldn't be be a mystery for you. "My experience is both theoretical and industry. - your price changes are, again, anecdotal. If you look at the nominal cost of fuel over the last 5 years, it has hardly changed. You argue that fuel doesn't track with world prices, but you have no basis to assume it should - do you know the forwarding positions, etc?" Interesting that the investigation noticed that this was not the case, hence the referral to the ComCom. "If you are a pricing analyst, this shouldn't be be a mystery for you." Interesting comment, I an guessing you haven't worked in Pricing, but are basing all your knowledge on economic theory? Suffice to say, in all my dealings with Pricing departments around the world, none have featured economists, or even economic majors. Most were statisticians, marketers, or accountants, or people like myself. I would blame your sample size for that. There are plenty of Economists/Econometricians in high level pricing positions. I have a reasonable sample size, some 30+ companies around the globe. THe only place I have ever met economists is in Govt. "The MBIE study had been unable to come to firm conclusions because of difficulties comparing information provided by companies and because "some very specific information that was required could not be obtained"
and that doesn't raise alarm bells. The fuel companies aren't exactly going to be offering up evidence against themselves are they. Hence why the recommendation to the ComCom. It's a bit harder to hide from them. Nymad asks for the evidence. But can't notice it's right there. KH can't see through the glow of her electric heater, reflecting off his/her tin foil hat. I agree, National have also set up some nice bargaining tools for Winston. National will have to give some pretty big concessions. He is gaining in the polls, and with Shane on the list now, he probably has two electorate seats + his percentage. It could be enough to make him a solid third. THe maori party stabbed Helen Clark in the back and have been in the back pocket of the National party ever since. I doubt Labour will want anything to do with them. NZF have already articulated their position. Personally I initially thought the Maori party was a complete waste of time and they would end up in a unused part of parliament and gather dust. However I have nothing but admiration for the first two co-leaders and while not entirely ,or all that often agreeing with the party policy in general, you cannot fail to respect their advocacy for their people and a certain amount of forthrightness that is so sadly lacking in all the other parties. I am not a Maori so my opinion might be considered irrelevant as such, but I do believe the very significant results and progress that were achieved by the Maori Party for their people, by being in government with National in those early days, are overlooked and even maligned. The targeting of the Pacific Island vote by the maori party is simply cynical and contemptible. Yes, there is some logic in a party representing and putting forward the treaty rights of Maori. But to expand that in order to create a "brown people's party" is racial separatism of the kind we don't want in New Zealand. I have not understood the Maori parties support of Nationals population growth policy. It is another wave of colonialism further alienating there people within their own land. The pressure on house prices, land prices, resources and lifestyle has been hardest on urban Maori and Pasifica. The Maori people are suffering the most from the policies that the Maori party support just to be fed a few scraps. Colonization is alive and well.